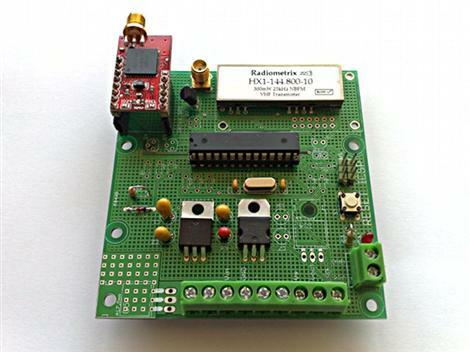 Trackuino is a new open source (GPLv2 license) Arduino APRS tracker designed by [Javier Martin]. If you are unfamiliar: APRS (Automatic Packet Reporting System) is an amateur radio method used to relay small packets of position-tracking data to an online database for easy access and mapping. In this case, GPS telemetry data is used to track latitude, longitude, altitude, course, speed, and time measurements in near real-time via aprs.fi. Although this reminds us of the WhereAVR that we covered previously, the Trackuino includes an onboard radio so no external handheld unit is necessary. Since the Trackuino was designed primarily for high-altitude balloon tracking, a number of useful related features are also included: dual temperature sensors, support for a humidity sensor, and a remote “cut-down” trigger really make this a complete package. Initially there was some concern that the 300mW radio used would not be powerful enough to reach the ground-based receivers from peak altitudes. This was clearly not an issue however, as the signal was heard from nearly 600Km away during the maiden voyage. If this still doesn’t sound like enough power, a 500mW radio is also supported. Make sure to check out [Javier]’s blog for some amazing high-altitude photos and everything needed to get your own Trackuino up and running in no time! I want to launch weather balloon sooo Bad! it is on google code. it doesn’t like links in the comments. After googling for the project, and reading the data sheet for the module, I’m not so sure about this. I’m happy they’re getting results, but I don’t think the TXD line on the module is really meant to be PWM’d. I’m concerned that there would be “splattering” on adjacent channels using this method. It’s the license requirements that still get me. This looks like an awesome project though. @trialex It’s so easy to get your license these days, Take the practice tests here http://www.qrz.com/exams and try it out. If you’re not licensed, you could replace the radiometrix module with another for one of the unlicensed bands for whatever country your in. In Australia at least, the foundation license only allows you to transmit voice. For data you need a standard license which is much more difficult to get. We tested it with a spectrum analyzer and it is well within acceptable limits. The HX1 is made to have TTL input. It then converts the serial to a FSK RF output. So the HX1 ONLY does FSK data. We are working on software FSK so that it could be used with another radio utilizing the mic input. I have the whole work up to the launch on my blog. I am working on a debrief post right now. Good enough for me, but I have another question… I thought APRS was AFSK. So, you are kinda-sorta AFSK-ing with PWM? The license… (in the US anyway) is only 35 questions. and took me about 3 hours of doing the practice exams that John posted. I passed the test no problem. I stand corrected, it is full AFSK. The cost for each of the three exams is $70. For my balloon project I just put a message on a local HAM message board and teamed up with someone who was interested. Any no license required similar equipment? “Trackuino”?? Seriously? sounds like a “douchuino” named this thing. I should mention I only ask questions in such a direct way when I’m really seriously considering using something. I wrote code for the ATMega that did AFSK bell 202 1200 baud modulation. I got stopped dead in my tracks when it came to AX.25. I’m really happy that you wrote or found all that code. It is very likely that I’ll port it to C. (Down with C++ !! :) ) Nice project, b.t.w. I’ll send you a link if I do anything with it. I’ve got a few old 2 meter handheld transceivers that have been waiting for this. It’s all about 5 Watts of power!! I just happened to be bored at work today and started working on a fairly detailed simulation of a high altitude balloon system (ascent rate, thermal transfer from the capsule, etc), I come home and what do I see? The practice to my theory, good timing. This project is really everything I could want. I’ve always been put off by some of the closed source, expensive components necessary (I’m looking at you TNC). That incidentally was the first post I ever read on HaD (4 months after the blog started!) and has kept me coming back everyday since. We had a HAB project at my university that almost got off the ground (zing! ), but alas the project leader graduated. The higher you go up the less power is need to get out . 144.39mhz 500-600mw is good enough. We worked closely with the BEAR group in Canada to make sure our tracker was exactly what the HAB groups were looking for. One thing the BEAR group found was the Radiometrix module was prone to bad drift in cold environments. The MX146LV module that we used on our tracker has an on-board temp sensor used for compensation and keeps it from drifting. The result is a rock solid transmitter for just about any temp range. Our ground based RTrak trackers use these as well and we know of people that leave them in cars all of the time, in all kind of cold and hot weather. They keep going and stay on frequency. Well the AFSK magic is in the HX1. And the AX.25 is just the format of the serial data sent to it. So you can just send serial strings in the APRS format to the HX1. Javier is the guy to talk to about the specifics of that though. Wow, me too. That glider was an inspiration, for sure. It was showing me my street just a few hundred meters from my house. It took me a few moments to realize it was not tracking me and it was just someone participating in the project cruising down my street. If you don’t limit yourself to AX.25 (a particularly inefficient protocol which APRS is built on) you can actually get similar distances with much lower power. Over 500km has been achieved with only 10mw of power using the NTX2, the little brother of the module used here. I agree with Phil. 300mW only going 600KM with the transmitter at altitude? The antenna must be seriously mis-tuned; I can get 100KM from ground level at that power with just a longwire. Which radio receiver was used on the balloon for the remote cut-down mechanism mentioned in the summary? I’d like to implement a remote cut-down mechanism myself, I can’t seem to find any details on that on any of the linked pages. Thanks for clarifying this point.